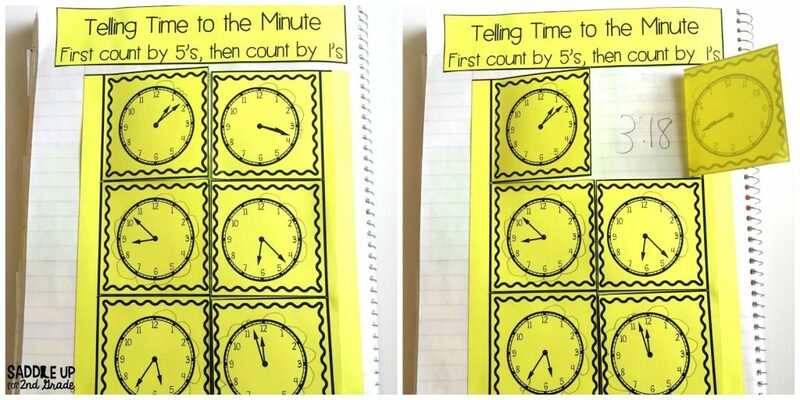 This week we’ve been working on telling time in one minute increments. This is the first year we’ve had to teach this particular skill. 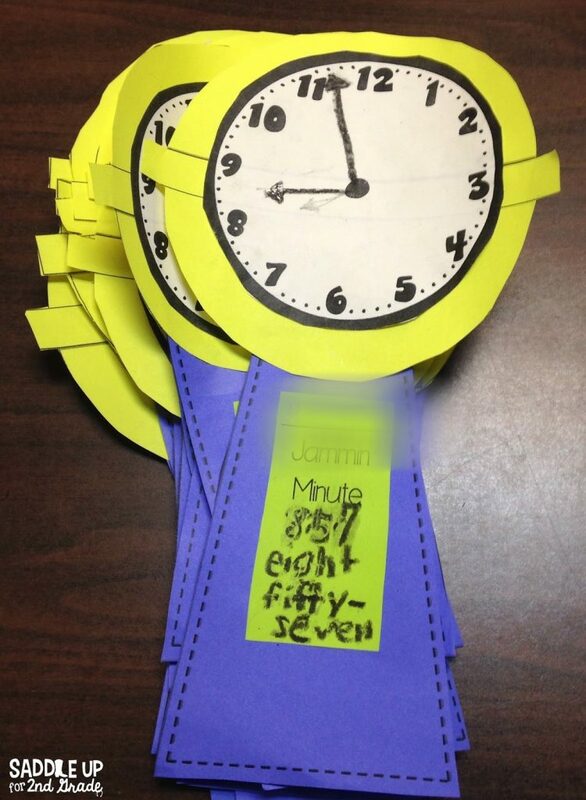 I was worried about them catching on since learning to tell time in five minute increments can be tricky for some. They caught on quickly though and did really well with it. 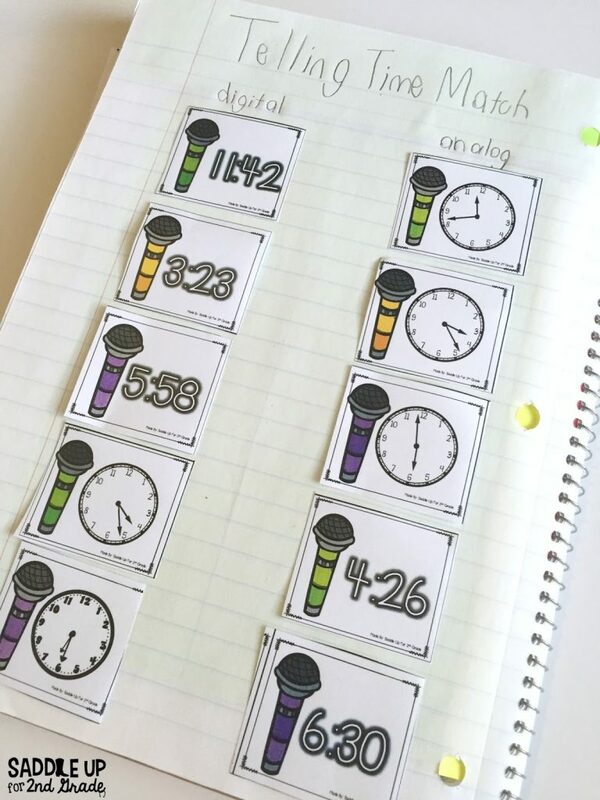 We started out by doing a quick review and practicing telling time in five minute increments since it’s been a few weeks since we talked about it. 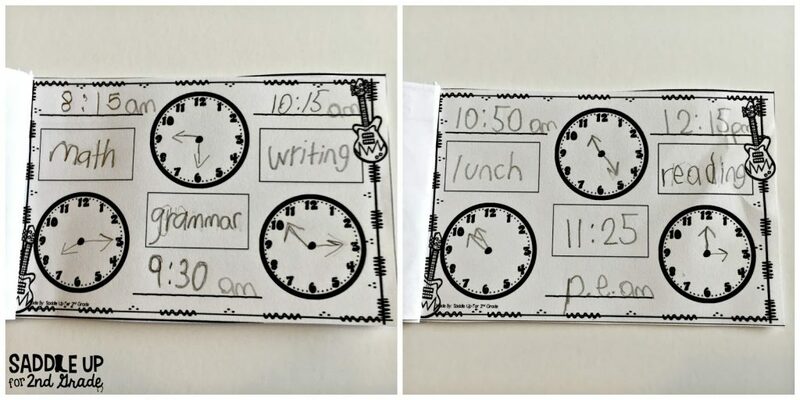 They added the clocks to their journals and labeled the parts. 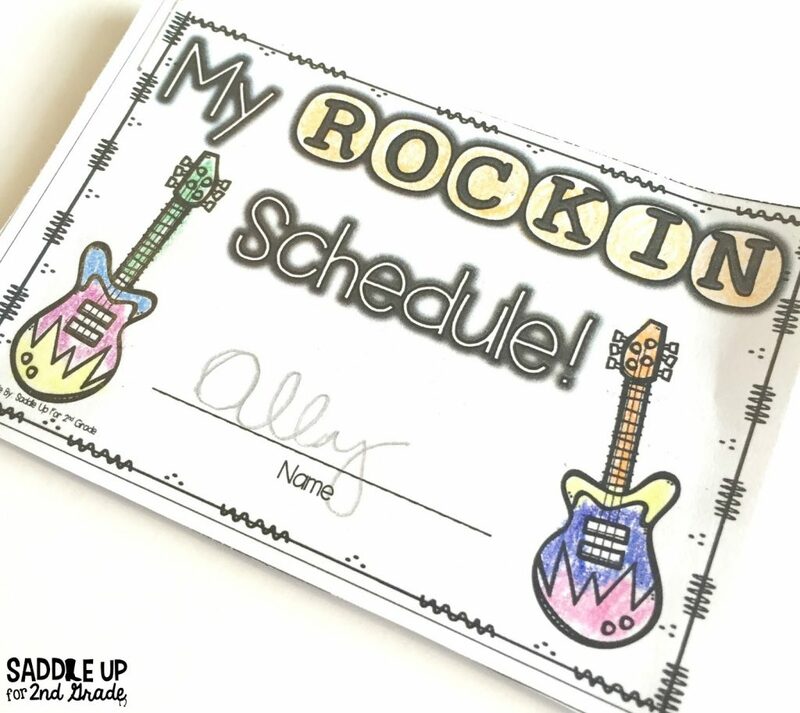 Then we made our rockin’ schedule books and labeled out our entire day. This was perfect for a quick review and it didn’t take much time at all. In small groups, we played I have, who has. 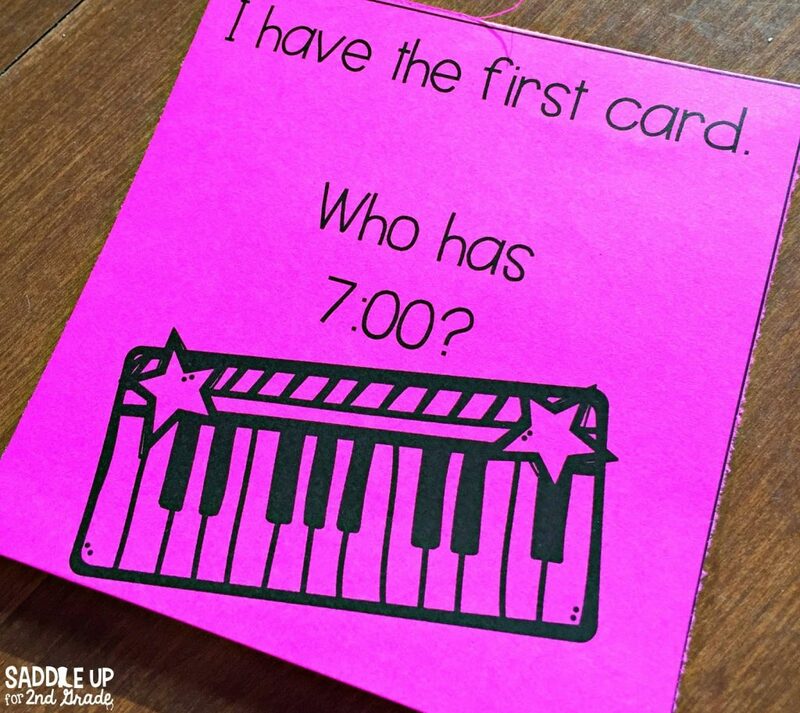 I gave each kid 2-3 cards and played a couple of rounds making sure that each child knew which time cards they had before beginning the game. 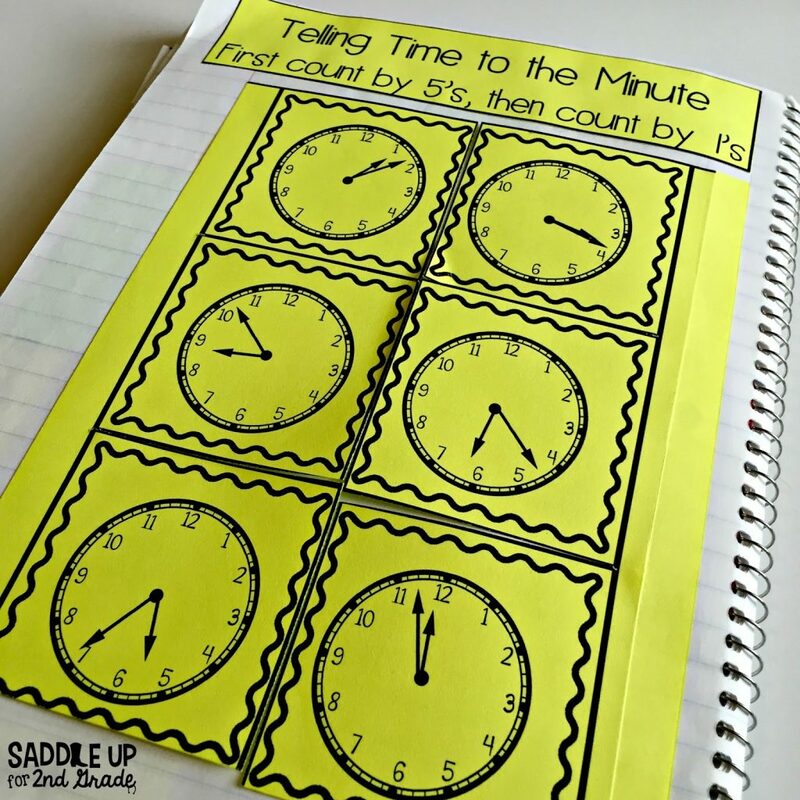 On Tuesday, we dove head first into time to the minute with this these journal activities. I teach them to skip count by 5’s first, and then count by 1’s. They practiced hopping around the clock. The big jumps equal 5 minutes and the small hops equal 1 minute. Then, they wrote the digital time underneath the flap. We did the first few together and then they did the last two on their own and was surprised at how quickly they caught on. 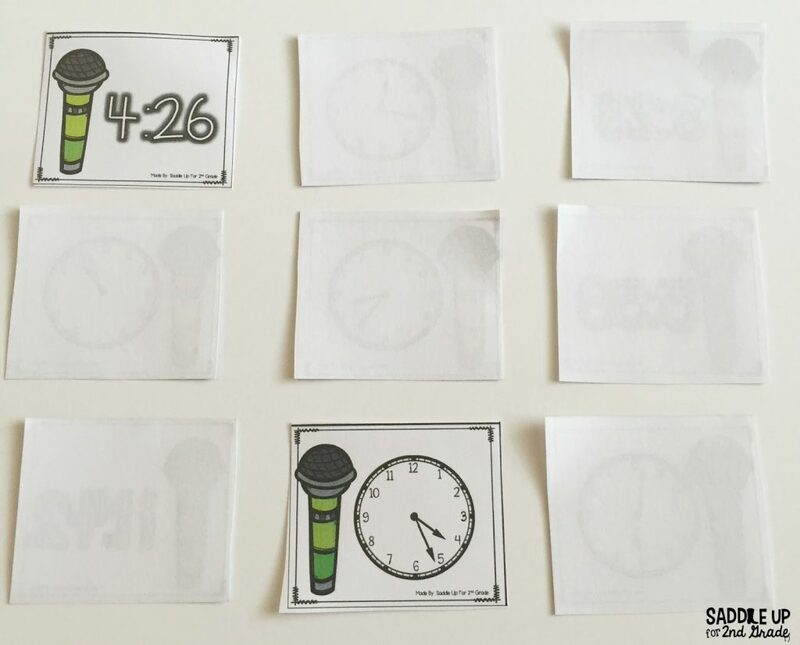 Wednesday, we did this fun whole group activity with the spot light cards. 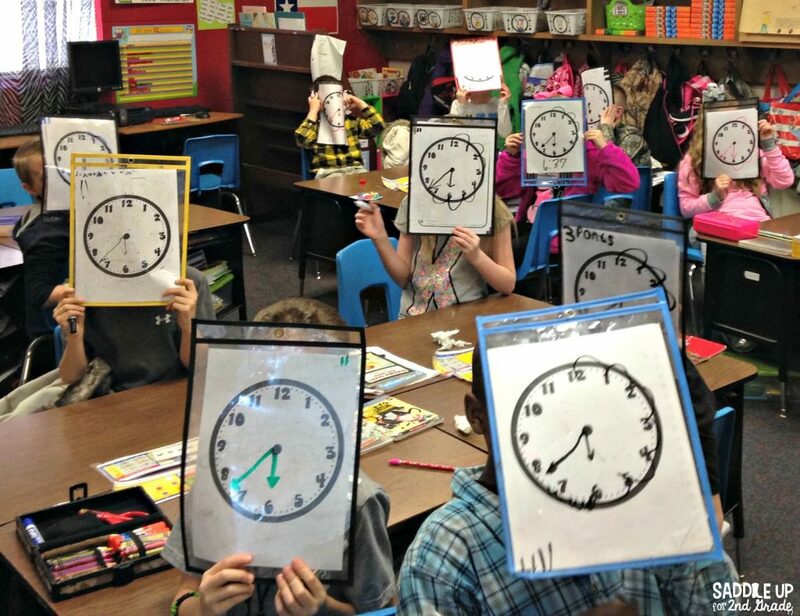 Each child had a blank clock and it was inside a plastic sleeve . I showed them a digital time card and they drew out the time on the analog clock. I like this rather than using Judy clocks because they are larger and I can see the actual minutes better. Now, I realize that the time shown on the cards, isn’t what the kids are showing. I just snapped a quick photo of the cards so you could see what they looked like. Some of them still needed to draw the jumps and some didn’t need it anymore. If they got it right, they got to give themselves a point. 2nd graders LOVE getting points! In small groups, I printed the match up cards 4 to a page. You can see how to do this here. I was able to print several sets in color and it didn’t use up much at all. Each kid had their own set. They practiced playing memory with a partner. Once they matched up all their cards, they glued them into their journals. On Thursday, we played Find Someone Who. 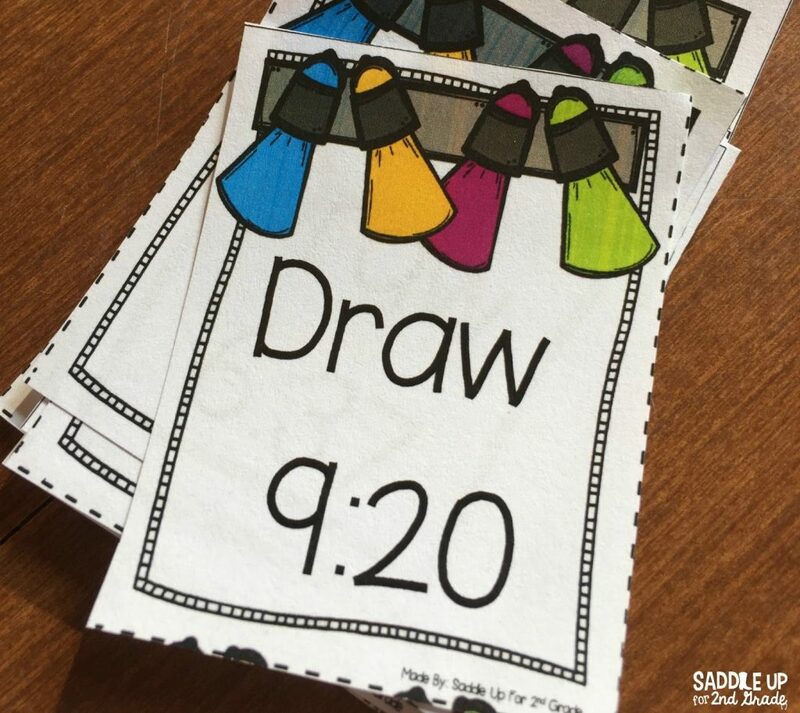 This is one of my favorite whole group activities because it allows for student teaching and learning. The students pair up and solve a problem on the other persons answer sheet. If they need help, they ask their partner. If neither one can solve, then they can come to me. Since, I don’t have an even number of students, I play along with them. If they come to me, I have them explain how they found their answer. 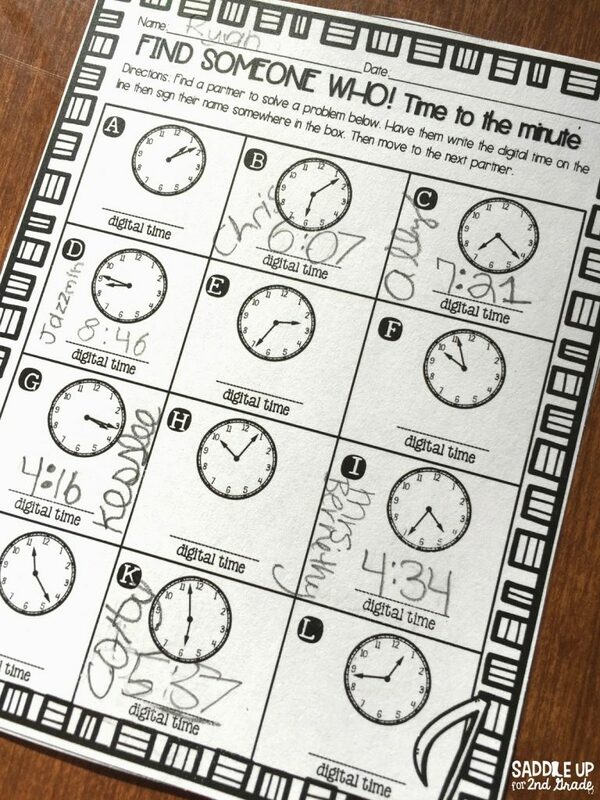 In small groups, we worked with task cards to find the digital time. I’m a huge fan of task cards because they are so versatile. I’ll place them in a center once we are done with our unit so the kids can keep practicing this skill. By Friday, they had everything down so we made out Jammin’ Minute Mics! 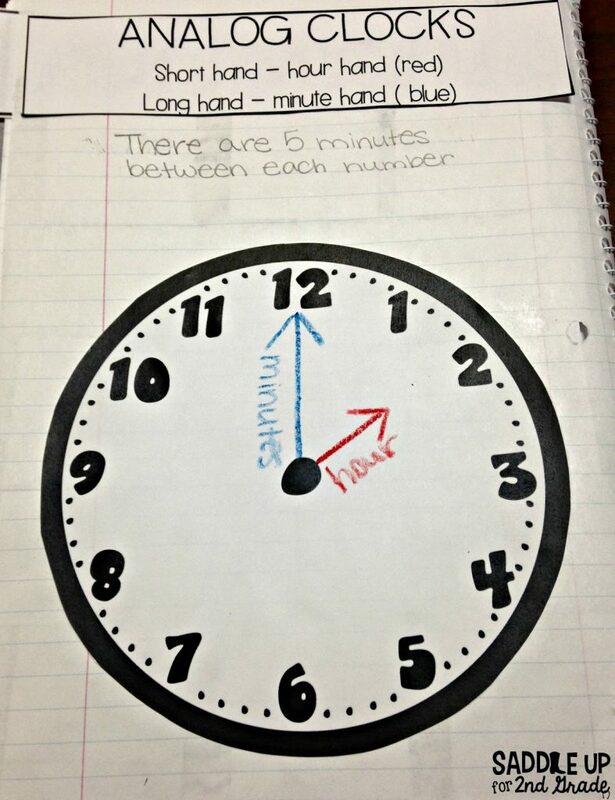 They picked their own time and drew the hands on the analog clock. Then wrote the time in the digital form and in word form. 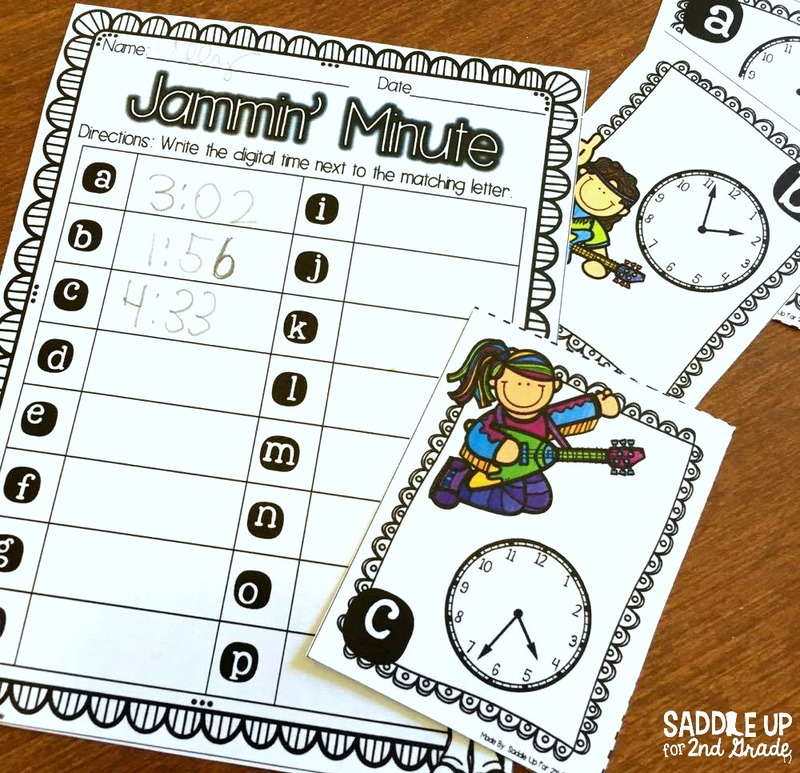 All of these activities are available in my Jammin’ Minute time unit. 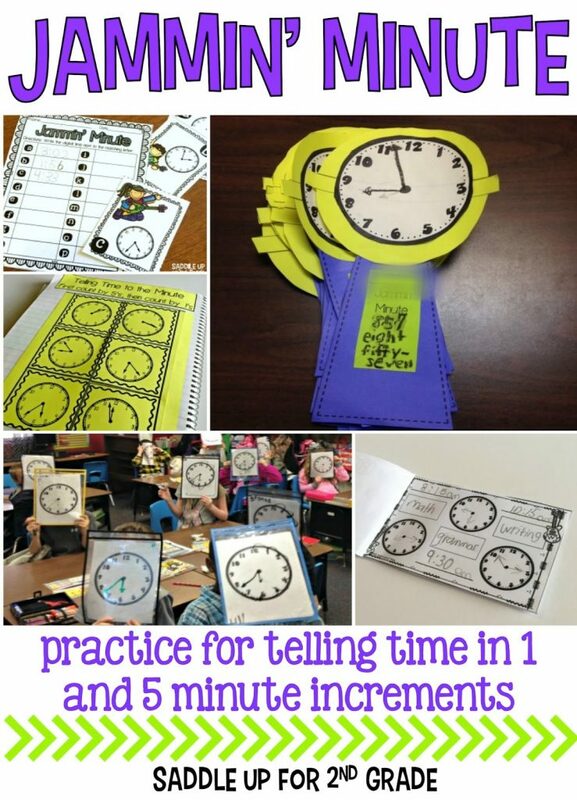 It’s full of activities and centers for practicing time in five and one minute increments. 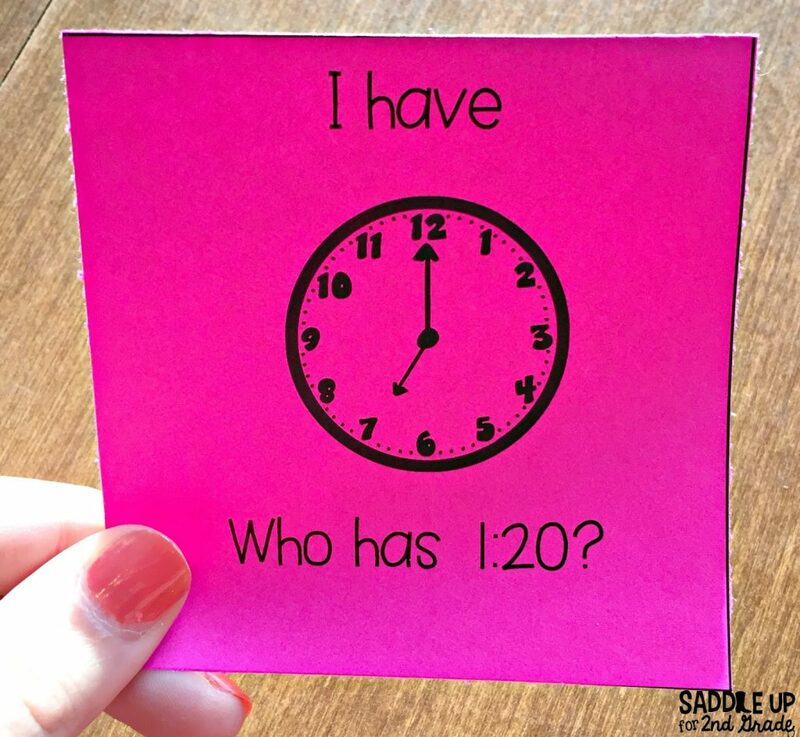 Are you look for more fun actives to use during your math block? Check out my math Pinterest board!